From past posts on Thanksgiving sides…Michael and I will be out-of-town for Thanksgiving, but I managed to prepare several dishes worthy of serving at anyone’s Thanksgiving dinner and we will taste the caponata and the stuffing tonight with our maple glazed Cornish hens. Heat the oil in a large saucepan over medium heat. Add the onion, carrot and celery, cook until the onion is translucent. Add the garlic and spices, cook for another 2 minutes. Add the herbs, capers, olives, currents, eggplant, pumpkin, bell pepper, tomatoes and water and season with salt and pepper. Simmer for an hour, stirring from time to time. Take off heat and add the vinegar and sugar, stir thoroughly. 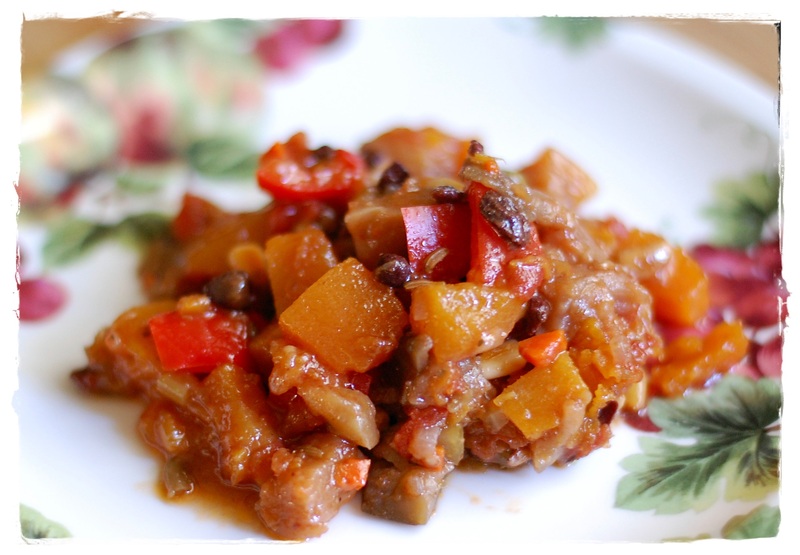 Adjust seasoning, cool and add the chopped parsley…Spoon warm caponata onto the toasted bruschetta and serve.